(Nanowerk News) A Spanish-US team of researchers has used a groundbreaking method to replicate the wings of butterflies and the colours of insects on a nanometric scale. The resulting technology has great potential to be used in a wide range of optical structures such as diffusers for solar panels or optical sensors. The results of the experiments are published in the journal Bioinspiration & Biomimetics. The iridescent beauty and fragility of a butterfly's wings have been celebrated by poets and painters since time immemorial, but now a scientific breakthrough has helped us actually replicate such mysteriously complex structures. A team of researchers from Spain's Universidad Autónoma de Madrid (UAM) and Pennsylvania State University in the US have developed a technique that can replicate such biological structures using nanotechnology. The new technique will be able to produce biomaterial that could be used to make structures such as diffusers for solar panels and other types of optical devices. 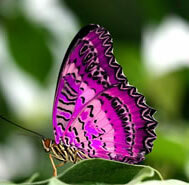 The researchers have created nanostructures that reproduce the colours and iridescence of insects. The ability of an insect to shimmer and change colour is caused by nano-sized photonic structures that are found in the cuticle (the outer covering of the insect's body). The researchers focused their studies on these photonic structures to create biomaterial that has light-emitting properties. 'This technique was developed at the Materials Research Institute of Pennsylvania State University and it enables replicas of biological structures to be made on a nanometric scale,' said Professor Raúl J. Martín-Palma, a lecturer in the Department of Applied Physics at UAM and co-author of the study. Up to now, the methods used to replicate biostructures on a nanometric scale have been limited, often damaging the original biostructure because of the high temperatures and toxic, corrosive substances that were applied. The new method uses a normal temperature and avoids toxins. It incorporates compounds based on the chemical elements Germanium, Selenium and Stibium (GeSeSb), using a technique called Conformal-Evaporated-Film-by-Rotation (CEFR). This combines thermal evaporation and substrate rotation in a low pressure chamber, and uses immersion in an aqueous orthophosphoric acid solution to dissolve the chitin (a substance found in the exoskeleton of insects and arthropods). Using this technique, the research team were able to create replicas of the nanostructures of butterfly wings. Professor Martín-Palma believes that the nanostructures could be used to make optically active structures such as optical diffusers or coverings to maximise solar light cell absorption. 'Furthermore, the techniques can be used to replicate other biological structures, such as beetle shells or the compound eyes of flies, bees and wasps,' he said.